Annan followed up their excellent mid week victory in the Irn Bru Cup with a convincing victory over Berwick Rangers to get Annan’s League Campaign up and running. It was a five star performance from Annan who responded magnificently after going behind from a 6th minute goal in a match played in awkward windy conditions. The Annan starting line up showed one change from the side which defeated Celtic mid week with Jim Atkinson taking over from Alex Mitchell in goal and new signing Blair Henderson taking a place on the bench. Annan started the game positively taking the game to the home team but after only 6 minutes Berwick scored with their first attacking move of the match. It a swift move down the left flank which cut open the Annan defence when McDonald and Murrells slick passing ended up with Murrell’s cross being swept into the net by Michael McKenna. It took Annan until the 20th minute before they cancelled out Berwicks advantage. Annan were awarded a free kick wide on the right. 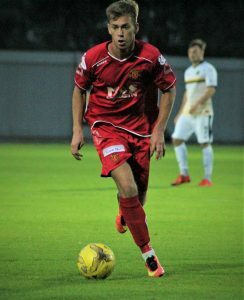 Ryan Sinnamon’s free kick caused all sorts of problems with the Berwick defence failing to clear their lines and the ball fell invitingly for Steven Swinglehurst who swept the ball into the corner of the net form 8 yards. Berwick were then dealt another blow 6 minutes later when Annan went ahead through a brilliant 20 yard strike from Ryan Sinnamon. It was a superbly well take goal from Sinnamon who drove forward after picking the ball up from Stevenson to finish with a stunning strike from outside the box. Sinnamon who was a constant thorn in the side to Berwick all afternoon was unlucky not score a second when his free kick cracked the outside of the post in the 31st minute as Annan continued to take the game to the home team. Annan secured a 2 goal advantage in the 43rd minute but this time the fingers were pointed at the Berwick defence as Sinnamon and Brandon Luke opened them up wide on the right, finishing with a cross ball to Murphy who made the best of the space offered to him by the Berwick defence to score the simplest of goals from 7 yards. Berwick started the second half playing down the slope and they had a good spell, Stephen Thomson tested Atkinson with a 20 yard effort followed by an Andy Irving effort which sailed over the bar. Murphy released Aidan Smith through on goal in the 57th minute but the Annan striker showed little composure blasting over the bar when he had the space in front of him to home in on goal. Annan had a let off minutes later when McDonald headed past the post from a cross delivered from the left. Swinglehurst was denied by a brilliant McCorie save in the 70th minute when he tipped the net bound header over the bar. Sinnamon then had a free kick deflected past the post as Annan started to impose their authority on the game. Swinglehurst was then denied by another stunning save from the Berwick keeper who somehow managed to turn the net bound header from the corner over the bar. The impressive Sinnamon then had a big hand in Annan’s fourth goal when he released Aidan Smith clean through on goal but the Berwick keeper upended the striker as Smith homed in on goal and the striker converted from the spot. Blair Henderson made his debut for Annan replacing Rabin Omar in the 78th minute and within minutes the striker got his account for the season up and running. Berwick Rangers –Robbie McCorie, Oliver Fleming (Pat Skullion 64 min), Stephen Notman ( Andy Irving 40 min), Kevin McKinlay, Stephen Thomson, Darren Lavery , Michael McKenna, Gary Phillips, Kieran Stewart (Greg Rutherford 64 min), Chris McDonald , Aaron Murrell . Subs not used Kevin Waugh, Jonny Fairburn, Callum Donaldson, Sean Brennan GK. Annan Athletic- Jim Atkinson, Scott Hooper, James Creaney, Peter Murphy (Owen Moxon 80 min), Peter Watson, Steven Swinglehurst, Ryan Sinnamon, Ryan Stevenson ( Daniel Orsi 60 min), Aidan Smith, , Rabin Omar (Blair Henderson 78 min), Brandon Luke. Subs not used Alex Mitchell, Ellis Pearson, Ayrton Sonkur, Jack Brannan. Referee – Mike Roncon, Assistants – Jordan Stokoe and Ryan Lee.